Defense specialists in Lancashire, England got a look at their nation's first remotely-controlled fighter aircraft. Named after the Celtic god of thunder, the "Taranis" is the United Kingdom's entry into the nascent field of Uncrewed Combat Air Vehicles or UCAV While the United States military has led in unmanned aerial vehicles, most famously with the Predator line, the difference here is that the Taranis is powered by a jet engine, rather than propellers. Gerald Howarth, the UK minister for international security strategy, was quoted by the British press saying that the craft would be piloted remotely with little human intervention. Officials, though, declined to get into operational details, such as whether the Taranis might ever decide on its own to take out a target. 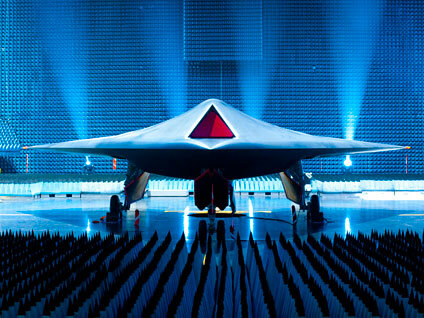 Taranis has been designed to be an unmanned, stealthy autonomous combat aircraft ultimately capable of delivering weapons to a battlefield in another continent. It will be able to hold an adversary at continuous risk of attack; to penetrate deep inside hostile territory, find a target, facilitate either kinetic or non kinetic influence upon it, assess the effect achieved, and provide intelligence back to commanders. Modern unmanned air vehicles (UAVs) first gained widespread notice during 1982 battles in Lebanon between Syria and Israel. The Israelis successfully took out much of Syria's radar defenses with the help of real time images transmitted by "mazlats," as they were dubbed by the Israel Defense Force. In the United States, Boeing earlier this decade developed a concept demonstrator for an unmanned combat air vehicle as did Northrop Grumman. However, the Pentagon subsequently terminated the so-called Joint Unmanned Combat Air Systems program. Meanwhile, Boeing expects to fly its "Phantom Ray" fying wing before the end of this year. As noted by CNET, the craft is "36 feet long and has a wingspan of 50 feet. Weighing in at 36,500 pounds, it has a cruising speed of 614 mph, or 0.8 Mach, and an operating altitude of 40,000 feet. It's powered by an F404-GE-102D turbofan engine."